Zionists stole Palestinian land: that's the mantra both the Palestinian Authority and Hamas teach their children and propagate in their media. This claim has vast importance, as Palestinian Media Watch explains: "Presenting the creation of the [Israeli] state as an act of theft and its continued existence as a historical injustice serves as the basis for the PA's non-recognition of Israel's right to exist." The accusation of theft also undermines Israel's position internationally. 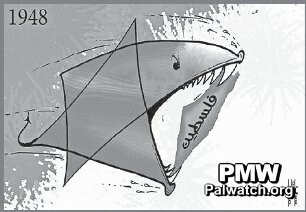 Palestinian imagery: A Star-of-David-shark devours Palestine. No, it is not. Ironically, the building of Israel represents about the most peaceable in-migration and state creation in history. To understand why requires seeing Zionism in context. Simply put, conquest is the historic norm; governments everywhere were established through invasion, nearly all states came into being at someone else's expense. No one is permanently in charge, everyone's roots trace back to somewhere else. Germanic tribes, Central Asian hordes, Russian tsars, and Spanish and Portuguese conquistadors remade the map. Modern Greeks have only a tenuous connection to the Greeks of antiquity. Who can count the number of times Belgium was overrun? The United States came into existence by defeating Native Americans. Kings marauded in Africa, Aryans invaded India. In Japan, Yamato-speakers eliminated all but tiny groups such as the Ainu. 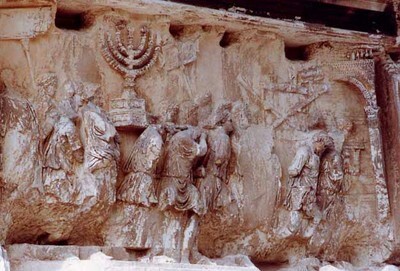 Many wars over Jerusalem: Emperor Titus celebrated his victory over the Jews in 70 A.D. with an arch showing Roman soldiers carrying off a menorah from the Temple. The land that now makes up Israel was no exception. In Jerusalem Besieged: From Ancient Canaan to Modern Israel, Eric H. Cline writes of Jerusalem: "No other city has been more bitterly fought over throughout its history." He backs up that claim, counting "at least 118 separate conflicts in and for Jerusalem during the past four millennia." He calculates Jerusalem to have been destroyed completely at least twice, besieged 23 times, captured 44 times, and attacked 52 times. The PA fantasizes that today's Palestinians are descended from a tribe of ancient Canaan, the Jebusites; in fact, but they are overwhelmingly the off-spring of invaders and immigrants seeking economic opportunities. Instead, they purchased land. Acquiring property dunam by dunam, farm by farm, house by house, lay at the heart of the Zionist enterprise until 1948. The Jewish National Fund, founded in 1901 to buy land in Palestine "to assist in the foundation of a new community of free Jews engaged in active and peaceable industry," was the key institution – and not the Haganah, the clandestine defense organization founded in 1920. Zionists also focused on the rehabilitation of what was barren and considered unusable. They not only made the desert bloom but drained swamps, cleared water channels, reclaimed wasteland, forested bare hills, cleared rocks, and removed salt from the soil. Jewish reclamation and sanitation work precipitously reduced the number of disease-related deaths. Only when the British mandatory power gave up on Palestine in 1948, followed immediately by an all-out attempt by Arab states to crush and expel the Zionists, did the latter take up the sword in self defense and go on to win land through military conquest. Even then, as the historian Efraim Karsh demonstrates in Palestine Betrayed, most Arabs fled their lands; exceedingly few were forced off. This history contradicts the Palestinian account that "Zionist gangs stole Palestine and expelled its people" which led to a catastrophe "unprecedented in history" (according to a PA 12th-grade textbook) or that Zionists "plundered the Palestinian land and national interests, and established their state upon the ruins of the Palestinian Arab people" (writes a columnist in the PA's daily). International organizations, newspaper editorials, and faculty petitions reiterate this falsehood worldwide. June 21, 2011 addendum: For additional points that did not fit this column, see the weblog entry, "Extras about Zionists Purchasing Israel, Not Stealing Palestine." June 22, 2011 update: Odd to be attacked from the right for pointing out that Zionists bought the land rather than steal it, but that's the case today on the Commentary magazine website, where I read that "It doesn't matter much how the land was acquired (though we did so legally) or what kind of land it was that we bought. It was – and is – ours by the natural right of the Jewish people to political independence in their native homeland." That's all very nice but - breaking news, here - not exactly everyone accepts that the land is "ours by ... natural right." For those skeptics it helps to establish that the land was legally acquired. This critique at Commentary reminds me about the disdain for Palestinian recognition of Israel as the Jewish state (on which, see my weblog entry, "Israel Does Not Need Palestinian Recognition? "), where Zionists also manifest too much pride to heed realities. June 23, 2011 update: A number of readers protested my reference above to "Aryans invaded India," saying that this is a discredited theory. In particular, Rajiv Malhotra sent me his article, "European Misappropriation of Sanskrit led to the Aryan Race Theory." Related Topics: Arab-Israel conflict & diplomacy, History, Israel & Zionism, Palestinians | Daniel Pipes receive the latest by email: subscribe to the free mef mailing list This text may be reposted or forwarded so long as it is presented as an integral whole with complete and accurate information provided about its author, date, place of publication, and original URL.